The SC100 filters and buffers data between a serial sensor and a CR10(X) or 21X datalogger. It is used in applications where the sensor transmits serial ASCII data asynchronously (i.e., a 4800 bps Global Positioning System receiver). The datalogger uses Program Instruction 151 and control ports to read data sent from the SC100. P15 reads data stream transmissions at 300 and 1200 bps only. The SC100 buffers up to 90 bytes of serial data received at 1200, 2400, 4800, 9600, 19200 and 38400 bps then transmits the buffered data to the datalogger at 1200 bps. The data (or commands) can also be transmitted from the datalogger to the sensor when required. In the received data, the SC100 search­es for a six-character, user-specified ASCII string (e.g., $GPGGA). It then buffers all data following the string until it encounters a termination character (e.g., carriage return). The SC100 and datalog­ger use control ports to coordinate data transfer; incoming data is placed in data­logger input locations to allow further processing or transfer to final storage. A minimum of five sequential control ports are required to receive serial data. A seven-conductor cable is required to con­nect the datalogger to the SC100 (the other two conductors are used for power and ground). The SC100 is powered by the datalogger’s 5 or 12 VDC supplies; power consumption is 55 mA active, 50 µA quiescent. 1. 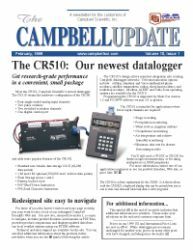 Program Instruction 15 is supported as a standard instruction in the CR10X and CR23X dataloggers. The CR10 and 21X require a $300 library special EPROM. The CR500, CR510, CR7 and CR9000 dataloggers do not support instruction 15 and cannot use the SC100 interface. The CR23X can buffer data through its control ports and serial port; therefore the SC100 is not required.